A to Z – Royalty. What’s in a Name? April 2016 A to Z Challenge – I’m writing about history. R is for Royalty. What’s in a Name? Royals have no surnames. That’s right. Queen Elizabeth is Her Royal Highness Queen Elizabeth. Period. Her family’s name is Windsor, but she doesn’t use it. She doesn’t have to. She’s married to Prince Philip. Period. He doesn’t use the Mountbatten part of his name. Their son Prince Charles was born His Royal Highness Charles Philip Arthur George. His father’s name of Mountbatten is not included. Not even the formal Mountbatten-Windsor is used. If a Royal does need a last name for anything, he or she uses the title of their parents. Prince Charles’s father is Prince Philip Duke of Edinburgh, so Prince Charles used Charles Edinburgh. Prince Charles is the Prince of Wales, so his sons, Prince William and Prince Harry, use the last name of Wales when at work with the Royal Air Force. Prince William’s son, George, can use Prince William’s title of Duke of Cambridge and be known in the real world as George Cambridge. Later, if Prince Charles becomes king and the title of Prince of Wales passes to Prince William, George can change his every-day name to George Wales. I guess that’s better than Mountbatten. And, a very happy birthday to the Queen – 90 years old today – April 21st. My grandmother, Ina Inez Burke Culpepper, was a warm and wonderful woman. We always celebrated her birthday on February 9, her death certificate lists her birth as February 9, her tombstone is chiseled February 9. Imagine my surprise when I received her birth certificate stating she was born at 10:00 pm on February 8! She was born in Mississippi in 1915 to John Patrick “Pat” Burke and Mary Howington Burke. She was the eldest of seven children, one dying as an infant. She grew up with three brothers and two sisters. Ina was a great cook and a professional seamstress, working at Meridian’s Burnley Shirt Factory. She spent many hours teaching me to sew when I was small. I was too young to get under her feet in the kitchen and still regret not being able to make biscuits as good as hers. She died in 1975 of complications of aortic valve replacement. I always thought she died at the age of 59, but now I wonder if she was only 58. She is laid to rest at Liberty Baptist Church Cemetery in Newton County, Mississippi, not far from where she was born. Happy 143rd Birthday, Aunt Dora! 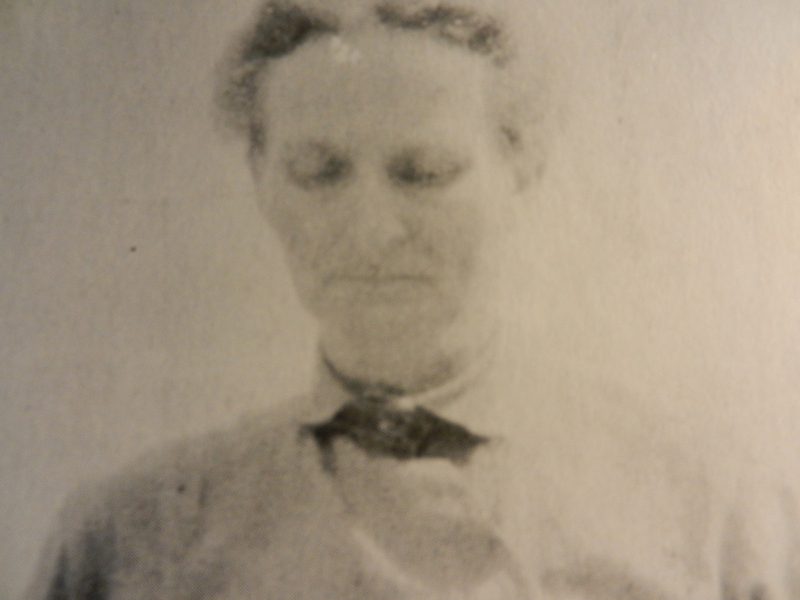 Mary Eudora Culpepper Saterfiel Watson was born March 31, 1871. 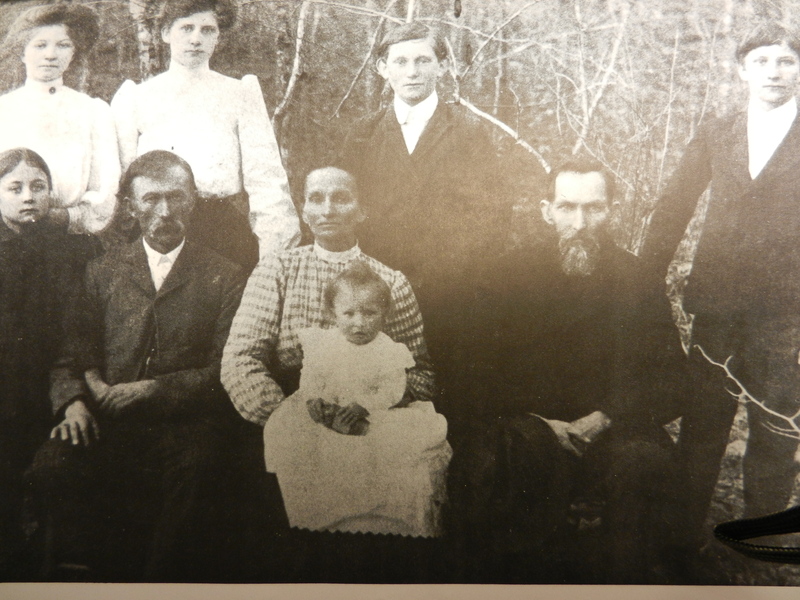 She is pictured here in the center with her husband WB Saterfiel to the left, her father JB Culpepper to the right, and her children from left to right in front Dewey Oliver Saterfiel and baby Alma. In the back row, left to right, Evie Mae Saterfiel Hodges, Indeola “Necie” Saterfiel Byrd, Willie Carlos Saterfiel, Adie Joseph Saterfiel. She was my grandpa’s aunt Dora. She was born to Joel B Culpepper and Mary E “Mollie” McFarland in Sumter County, Alabama, as the only girl with five brothers. There was another girl born to the union, but she died at birth. Aunt Dora was the eldest of the children, so I imagine she was the caregiver to her little brothers. At some point when the children were little, the family moved to Kemper County, MS. After her mother’s death in 1908, her father moved in with her for a short time. That’s when this photo was taken. Shortly after this, he was placed in a soldier’s home in Biloxi, MS, where he died less than a year later, on Nov. 11, 1911. Dora was 40. When she was about 19, she married William Bartley Saterfiel around 1890 and had six children. Three of her children married into the Hodges family. Mr. Hodges married three times, and with each union came more children. The three Saterfiel children married a Hodges child from each of the three wives. The Hodges/Saterfiel family reunion must be confusing. She lost her youngest child in 1912. Baby Alma was only five years old when she died, not very long after the top photo was taken. Mrs. G. W. Watson of Collinsville died Friday at St. Joseph Hospital, following a heart attack. Funeral will be held Sunday at 2 p.m. from the Union Funeral Home. The Rev. Edward McKeithen officiating. Interment will be in Union. Survivors include three sons: A. J. and D. O., Collinsville, and W. C. Saterfiel, Causeyville: Two daughters, Mesdames Joe Byrd and George Hodges, Collinsville: several grandchildren and great-grandchildren. 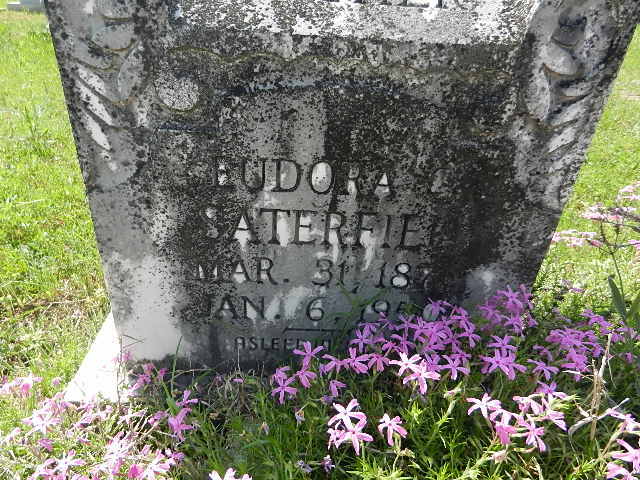 Her father, husband, and baby Alma are buried at Zion Cemetery, Kemper Co, MS. She and her other children are buried at Pine Grove Cemetery in Lauderdale Co, MS. Mr. Watson and his first wife are buried at Memorial Park in Newton Co, MS.